Encyclopedia of Cancer, Third Edition provides a comprehensive, up-to-date overview of the multiple facets of the disease, including research, treatment and societal impact. This new edition comprises 180 contributions from renown experts who present the latest in Mechanisms, Hallmarks of Cancer, Causes of Cancer, Prevention and Control, Diagnosis and Therapy, Pathology and the Genetics of specific Cancers. 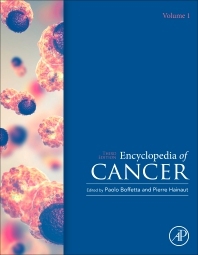 Readers will find a comprehensive overview of the main areas of oncology, including etiology, mechanisms, prevention, and treatments, from basic science to clinical applications and public health, all set alongside the latest advances and hot topics that have emerged since the previous edition. Topics of interest in the field, including genomics and epigenomics, our understanding of the causes of cancer and the approaches to preventing it (e.g., HPV vaccination, role of obesity and nutrition, molecular markers of environmental exposures), new screening techniques (e.g., low-dose CT for lung cancer) and improvements in the treatment of many cancers (e.g., breast cancer, lung adenocarcinoma) are comprehensively and authoritatively presented. Pierre Hainaut (born 1958, Belgium) is PhD in Biology, University of Liège, Belgium, 1987. After postdocs in France and in the UK (1988-1994), he joined the International Agency for Research on Cancer (IARC, World Health Organization) in 1994, where he held the post of head of Molecular Carcinogenesis from 1999 to 2011. In 2012, he joined the International Prevention Research Institute as Research Director. Since 2014, has been appointed as Professor of Cancer Biology and Chair of Excellence in Translational Research at Université Grenoble Alpes, France. Since October 2014, he is Director of the Institute of Advanced Biosciences (formerly Institut Albert Bonniot), a multi-thematic research center supported dedicated to Epigenetics, Chronic Diseases and Cancer (17 research teams). His research focuses on TP53 mutations and on biomarkers of transition from chronic diseases to cancer. From 1994 to 2011, he has led the development of the international IARC database of TP53 mutations, a source of information on the causes and consequences of mutations affecting the p53 suppressor protein in cancer. His current research focuses on gain-of-function effects in lung cancer and on biomarkers for early detection of liver and lung cancers, in particular in low-resource countries. Pierre Hainaut is author of over 400 publications and 50 book chapters (h index: 72, Google Scholar). He has co-edited two books on p53 (“25 Years of p53 Research” 2005, 2007, “p53 in the Clinics”, Springer) and a textbook of Molecular Epidemiology (“Molecular Epidemiology: Principle and Practice”, IARC Press, 2011). This book is a fantastic and helpful tool for basic scientists and clinicians.